◦The golf course is open for play daily April through November at 8:00 AM, weather permitting, except for Mondays, course opens at 12:00 PM. ◦Conditions permitting, and as designated by Peace Pipe Country Club staff, carts will be permitted off the cart paths. Keep carts at least 25 feet away from tees and greens. Carts around greens and tees will be strictly controlled and enforced to maintain optimum playing conditions. ◦Guests may play up to 5 times. Please contact the pro-shop when bringing more than a foursome. ◦At Peace Pipe Country Club, appropriate golf attire is required. Shirts must have a collar, or mock collar. Tee shirts, sweat pants, and sweat suits are not permitted. The dress code is strictly enforced. Members and their guests are not permitted to use club facilities if attire is inappropriate. As a member, it is your responsibility to inform your guests of ALL Club policies. Dress Code is for men, women, and juniors. ◦Maintain pace of play. Keep up with the group ahead of you. ◦Don’t play until the group in front of you is out of the way. 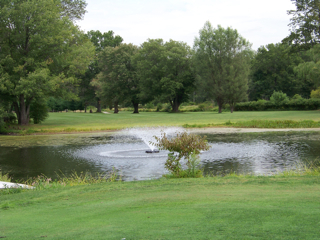 ◦Do not spend more than five minutes looking for a lost ball or trying to “rescue” balls from the water. ◦Invite faster groups to play through. ◦Repair divot holes. Smooth out footprints in bunkers. ◦Repair ball marks on greens. ◦Don’t move, talk, or stand close to or directly in front or behind a player making a stroke. ◦Don’t step on the line of another’s putt. ◦Don’t drop clubs on the putting green. ◦Replace the flagstick carefully in an upright position. ◦To ensure that all golfers have an enjoyable round, maintain the pace of play. ◦Leave the putting green as soon as all players in your group have holed out. ◦Adhere to daily golf cart restrictions as posted. ◦Golfers must observe the dress code at all times. ◦Leave the course in the condition in which you would like to find it. ◦USGA and Local rules shall govern all play.